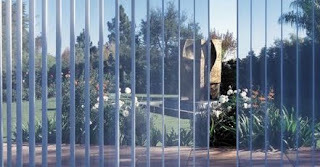 Luminette Privacy Sheers are a great way to cover large expanse of windows. It has translucent fabric the rotates to give you many different degrees of light control. Forget about those outdated vinyl vertical blinds you have in your home currently and transform you space into something extraordinary with the Luminettes. I love these - I am looking to replace the vertical blinds in my sun room. I love that these have that same versatility. These are on my list now! Thanks, Cindy!